French featherweight Taylor Lapilus has signed with the UFC and has agreed to face Dennis Siver after Robert Whiteford pulled out of the bout with an undisclosed injury. UFC officials announced the change on Wednesday morning. 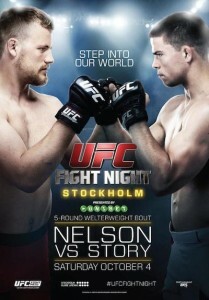 UFC Fight Night 53 will come from the Ericsson Globe in Stockholm, Sweden on October 4th and will be headlined by Gunnar Nelson meeting Rick Story in a welterweight bout. Lapilus (8-1) has won three fights in a row and two of those wins have come by submission, including a guillotine choke win in May against Cyril Ericher. Six of his eight victories have come by submission and five of them have come in the first round. Siver (21-9, 1NC) was suspended by the Nevada State Athletic Commission following his decision win against Manny Gamburyan at UFC 168. He tested positive for hCg and received a suspension of nine months, along with the result of the fight being overturned to a no-contest. The current UFC Fight Night 53: Nelson vs. Story fight card lineup is below.